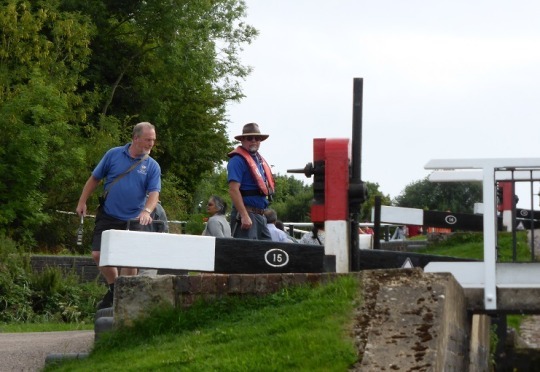 There was a nice couple moored in front of us on Toe the Line, we were up and ready to go at 0830 for the 15 locks to Foxton but would definitely prefer sailing in convoy, so we let them gather their senses, have a fry up and then leave together … at 0940. We didn’t take many pix as we had come this way before. Much easier going back as we’d done this stretch all on our own some 3 weeks ago. Gosh is it only 3 weeks – seems like we’ve been out for months. Easily losing track of the day now. 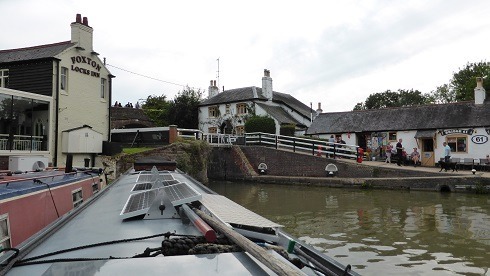 We arrived at Foxton hours ahead of any plan that we might of had, even though we were following a day-hire boat who’s occupants drove at 1 mph all the way from Saddington tunnel to Foxton. Odd. 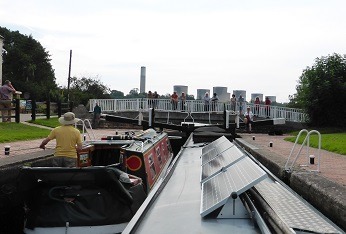 Still much to our surprise, Foxton wasn’t that busy, it was late afternoon and so we were added to the Lock keeper’s list of boats. 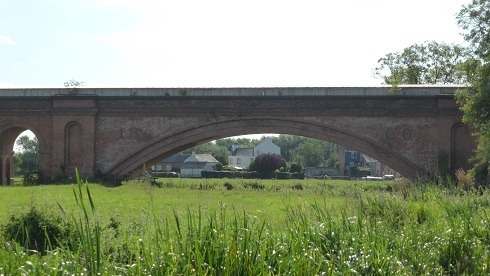 As soon as Life Goes On (also from Yelvertoft) comes down we could go in! 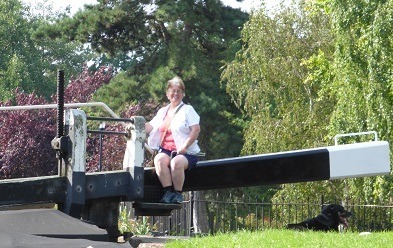 Viv was going to drive this time and I’d do the locks! 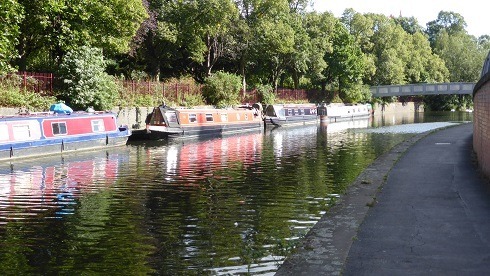 A big Grockle centre this and a pain to “moor and wait” as opposite to us is a tour boat’s moorings and there are so many others coming and going . . you can see here the two pubs plus souvenir shop … right off we go Viv . .
all I did was wind up the very easy paddles and chat with the volunteer lock keepers and grockles. All the gates were opened by young children …good. 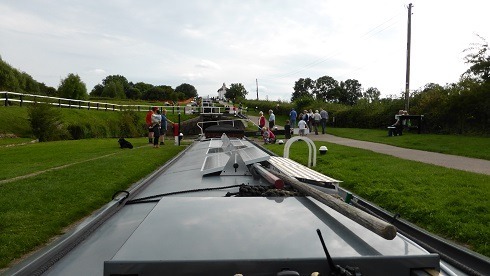 Quite a quick uphill climb and a moor up at the visitor moorings along the top level but we had a problem – loud rumblings from the prop and no steering! After a longish day, time for a remedial pint of Inclined Plane at the Bridge 61 pub and then back for turkey risotto leftovers. 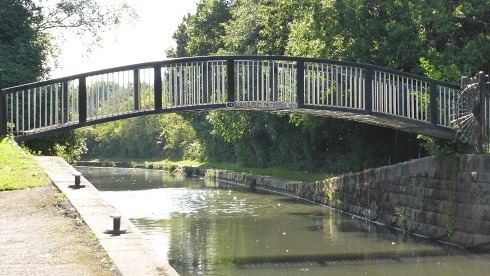 So that’s it, no more locks, we’ve done 144 in total and will have covered around 166 miles. 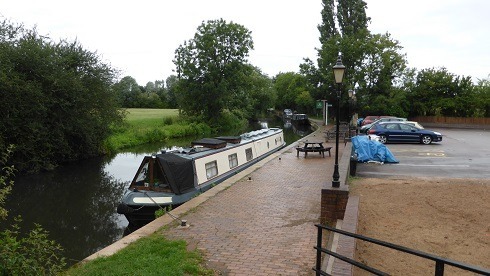 We’ll move from here later, after the rain (which has so far failed to arrive) to Welford for the Bank Holiday weather (yes a whole day of rain forecast) and then hopefully some of that remedial painting if we can. 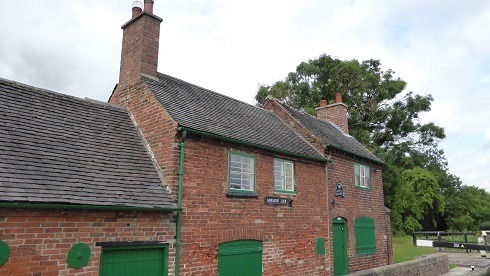 Then it’s back to home at Yelvertoft and then back to the house to try and get it rented out. 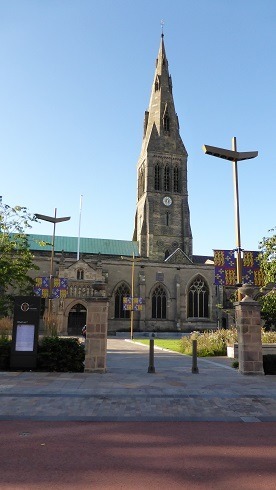 A nice bright day as we bid farewell to the city of Leicester. 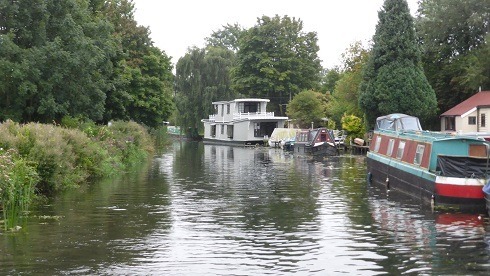 Dozens of swans gather on this stretch as we head for Freeman’s Meadow Lock. I snapped this one coming in to land. 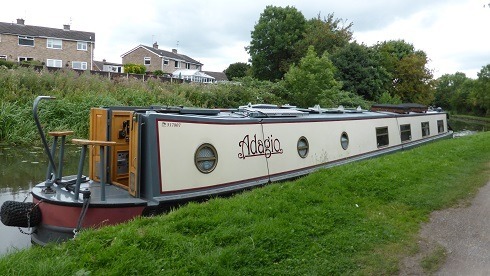 We did see a neighbour, Peggy Ellen, opposite but they didn’t seem ready to go so we pushed off … they came along later and caught us up. 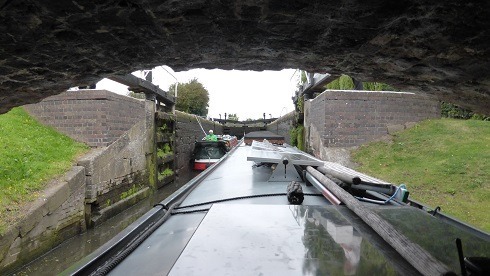 So, in convoy again – nice, as these locks can be heavy. 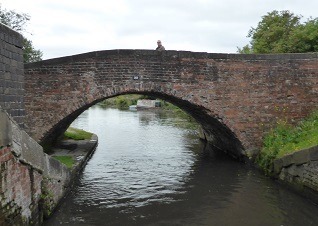 Kilby bridge for lunch & overnight. A scenic spot. 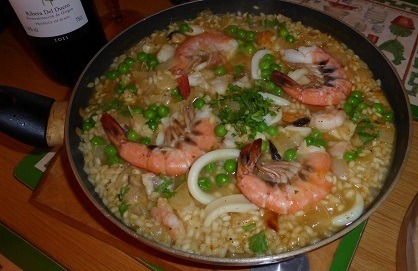 Evening meal was over in the Navigation. 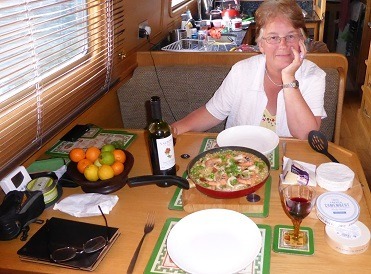 Friday night is fish night, so Steve had a Navigation burger (£6.95) and Viv had Thai fishcakes. Very tasty and good value with Adnams Broadside to wash them down. 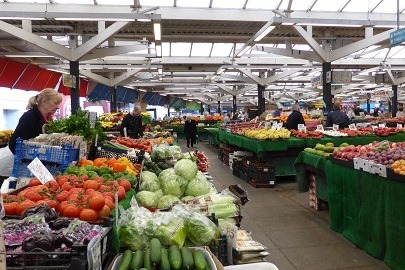 Day 18, I think, Leicester! 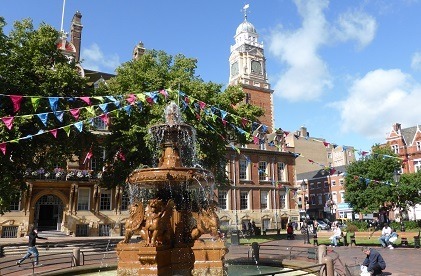 Quite a pleasant city . . 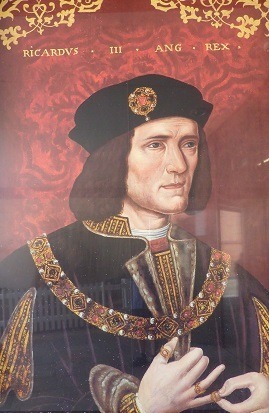 Saw his tomb in the cathedral but wasn’t too keen to pay the £7.65 to visit the Richard III experience … I can’t but helping thinking about the rhyming slang! Saw this strange craft passing by … it’s a weed cutter. 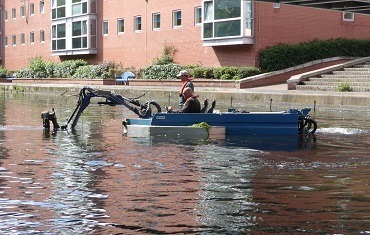 It has a giant underwater cutter … could have done with this ahead of us on the Erewash Canal. 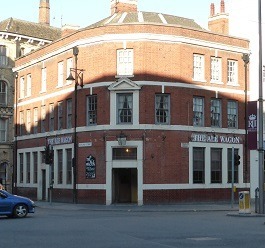 and our quest … to locate the Ale Wagon – owned by the Hoskins family, who used to have their own brewery (Tom Hoskins) many years ago. Some good beers (Tiny Rebel – “Dirty Stop Out”, oak smoked stout, nice and a few of their own beers too). 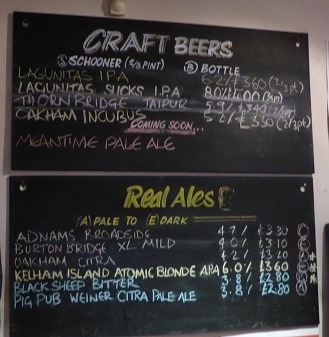 where we tried their Pig Pub beer “Weiner Citra” – very nice. Shortish day today as rain promised in the afternoon. 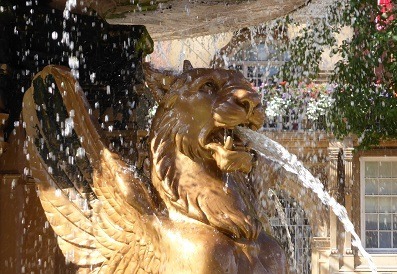 We’ve had very Camelot weather on this trip, i.e. sun during the day and rain at night or after we’ve stopped chugging along. 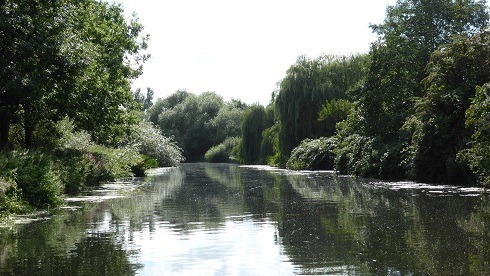 So 3 to 4 hours today – lovely bimble along the river Soar. The boat really does pick up her skirts and zoom along. 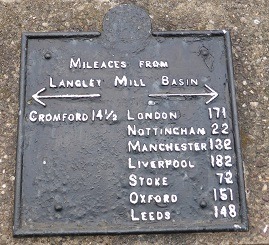 It’s actually nice to retrace our steps … we went too fast & too rushed coming down, so chance to have another look. 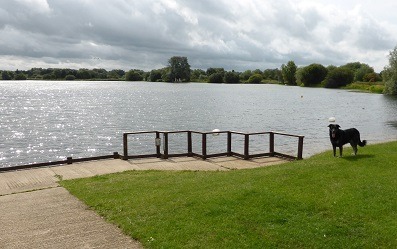 Some very twisty bits, then Barrow-upon-Soar, Mountsorrel … then back to Wanlip and Watermead Country Park – full of lakes for the Boggle to go for a swim or six. 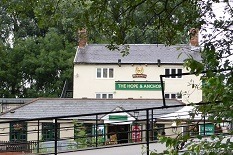 We decided to moor at the Hope & Anchor (is there a theme to this trip?? 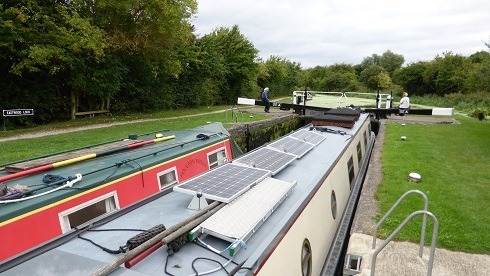 ), as there’s free mooring, a water point and open views to assist the solar panels … although in the rain – they don’t do much. Still, an amp is an amp. 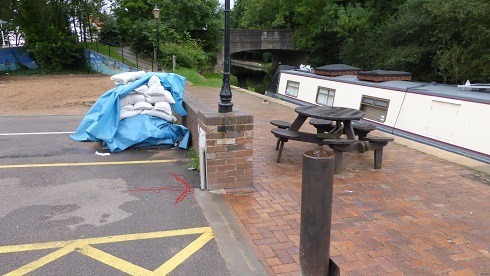 We’ve collected nearly 300 ampere-hours so far … only 36,000 to go to recoup the outlay! 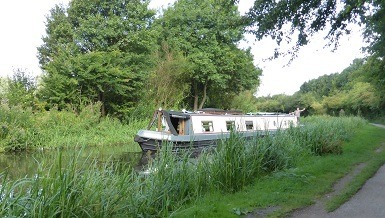 The main point of having them is to lay off using the engine to charge batteries in a nice secluded & quiet spot. Talking of that black Boggle, here he is. 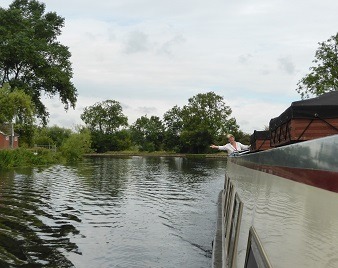 Still a bit skittish over boat life and every bump makes him cry “Let me off!”. Still, I’d like to think he is getting better. 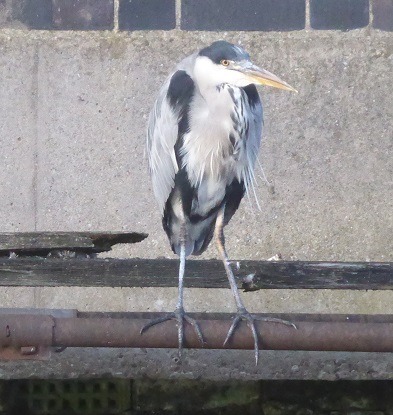 Saw this fellah, opposite our mooring today. 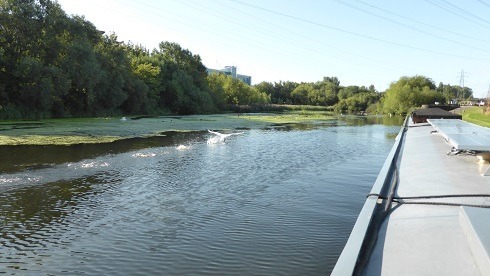 We also spotted an otter swimming across the river. 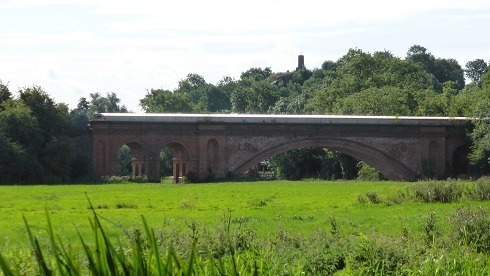 The 1860 conveyor or Echo bridge, No 25 near Mountsorrel. 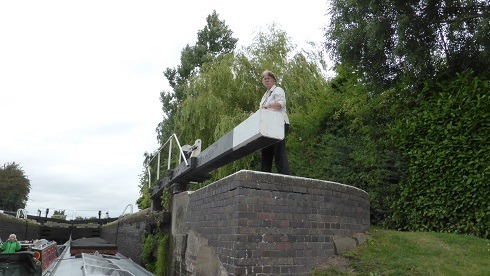 With rain forecast later (we aim to avoid boating in the rain), we set off from Trent Lock at 0840 and steamed from the Trent to the Soar … Kegworth Deep Lock, Normanton, Zouch (pronounced Zotch, we’re told) and back to our mooring right beside the Albion pub. 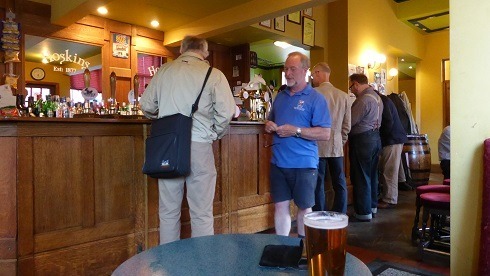 We gave Toby a decent walk into town via the Organ Grinder (a Blue Monkey Brewery pub – we had some Infinity (quite good) and some Marmoset (OK) – a great place!) and then the Queen’s park. 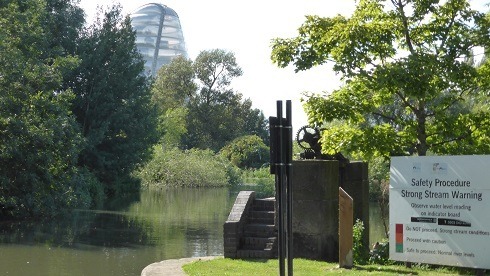 A beautiful park with magnificent flower beds, a bandstand and even an aviary. We also got Toby’s blue ball stuck in a tree (how does Steven do that??). We asked a kid (Assim?) 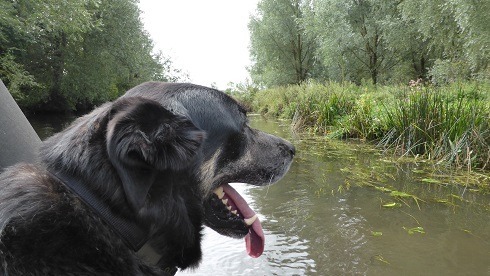 to help with his small football but no luck – we even got that stuck too – really embarrassing!! Then a group of students came over and some lads climbed onto one another’s shoulders and pulled bits of tree down until the ball fell . Cheers, guys. 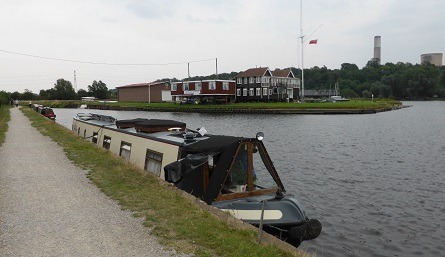 We passed Pinxton Roses – all safe and snug at the Soar Boating Club! Has it really been a fortnight? Seems more like a whole month or two? Had a slight lie in – didn’t start up until 0840. 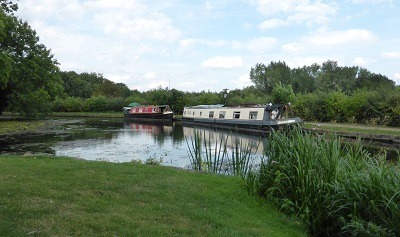 Just a short 2 -3 hr trip from Sandiacre, down the Erewash to Trent Lock and moor on the Trent for the night. 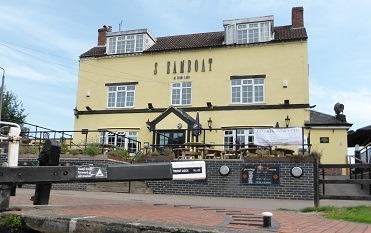 A pint in the Steamboat (oo err, 3 times in a week??) to say Goodbye to Bob & Carolyn – won’t be the same without them! 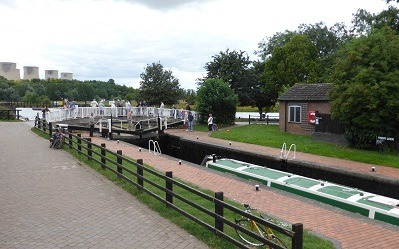 Ah, Trent Lock and already the crowd gathers . .
Could it be the Steamboat pub? They had Dragon Slayer and a Double Stout (Nottingham brewery and 7.3%). Plus a Turkey roast dinner for £7.95. 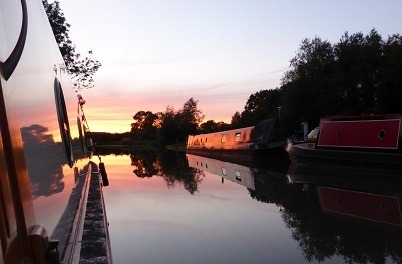 Time to say our farewell to Bob & Carolyn and moor up for the night. a very windy spot and a lee shore but nice to be next to a great expanse of water again. 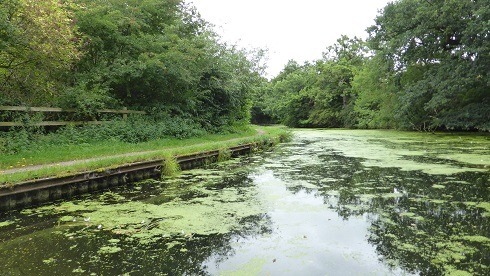 Time to head back down the weed-strewn, shallow canal. Plan to take it easy. 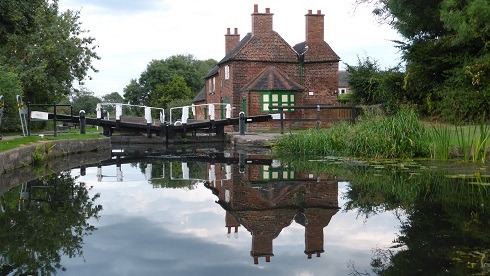 Moor at the scenic Sandiacre cottages by the weir. 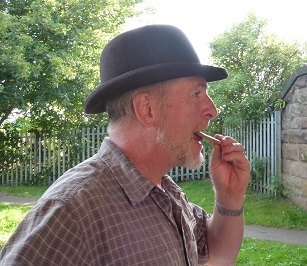 There goes Mr Robert (Bob) Harding in Pinxton Roses – our travelling companion for the last few days. 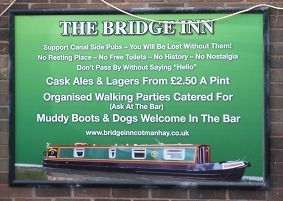 why can’t all pubs be like this one? 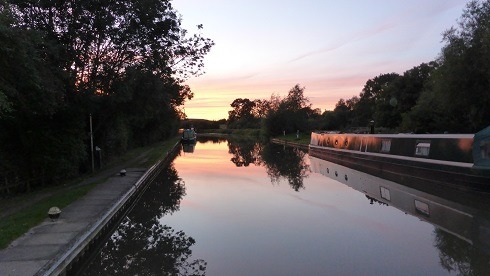 After struggling back through all the weeds and unwieldy locks, we arrive back here, a nice serene spot. 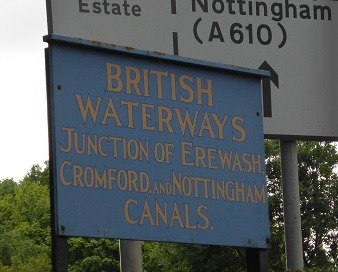 And the site of the former entrance to the Derby canal. 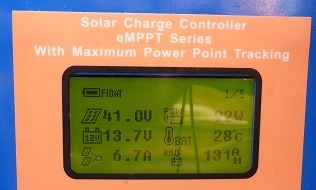 All charged up and on float – despite all the cloudy & rainy weather, we’ve still put 131 Ah’s into the batteries, which is nice. 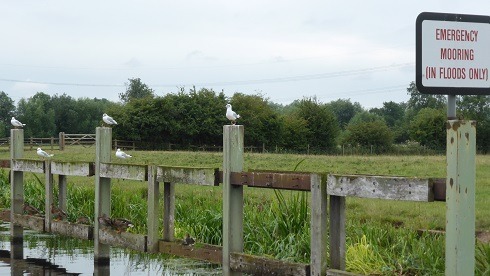 Still travelling with our lovely companions: Bob & Caroline, we agreed a set off time of at 0845 and travelled with some trepidation as the outskirts of Ilkeston were supposed to be a bit, well, dodgy. However, it all seemed fine to us. 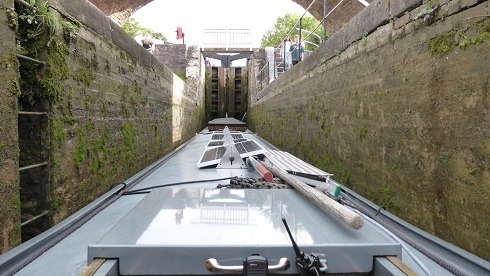 Still finding all the locks very heavy, hard to shift and paddle gear that refuses to budge. 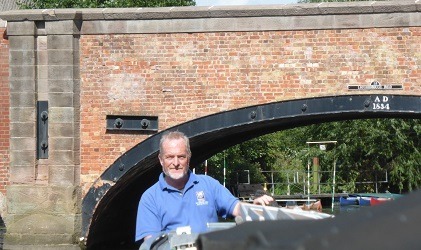 Bob’s magic ratchett windlass managed to shift em all.Some very low bridges and the final stretch above Eastwood lock was a mass of green – covered in weed and propeller grabbing reeds underneath. 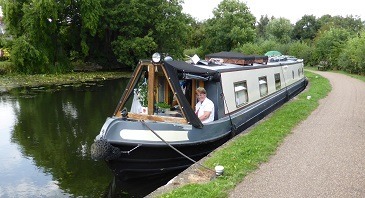 Very slow progress – African Queen stuff indeed but we made it and even managed to fit in the wee basin at the end. 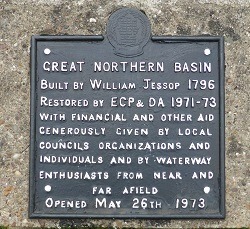 This is the end of the Erewash but the start of what was the Cromford canal and Nottingham canal. 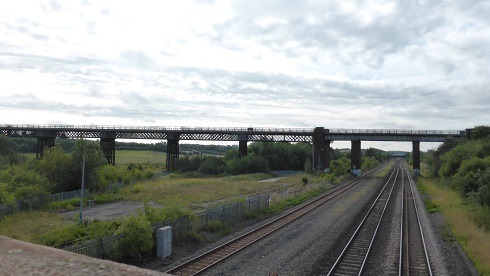 Not a very scenic spot but very handy for Asda, B&Q and a great pub: The Great Northern. 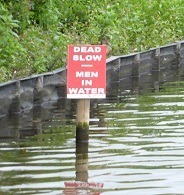 An unusual sign – looked around for em but didn’t see any. Nice meal in the pub (2 for £10! 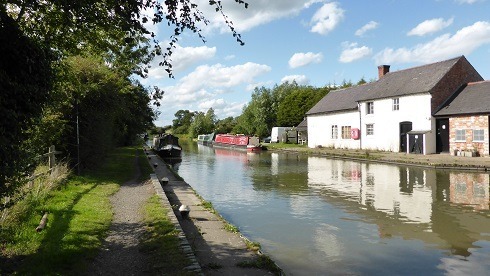 Plus Oakham beer …) and then the trek back tomorrow … . 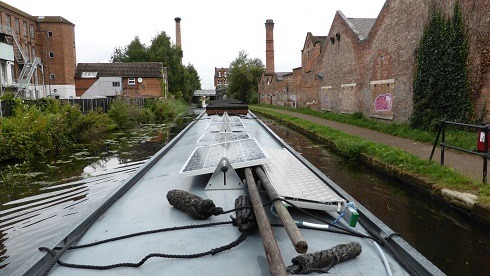 Yesterday was spent retracing our steps back through the Nottingham canal (pitstop at Sainsbury’s – again!) 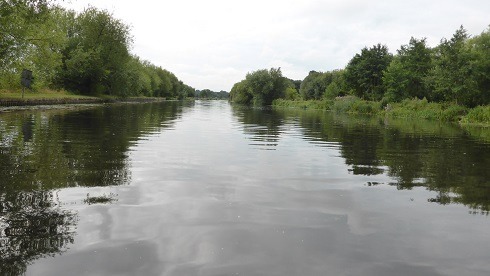 and then back up the Trent to Trent Lock. So confident was I that Viv was in control of the boat, that I took a shower and left Viv on the helm for this river trip. Magnificent. 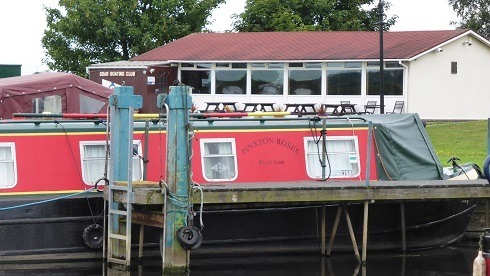 More rain overnight but beer back at the Steam Boat Inn, nice. 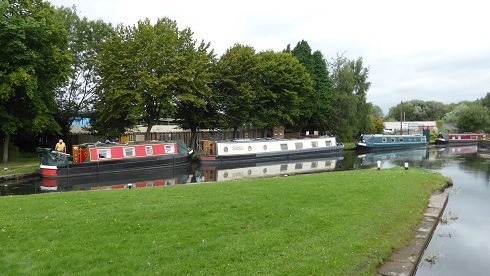 Today we started off in the drizzle but it soon cleared as we actually passed thru Trent Lock and into the Erewash Canal. 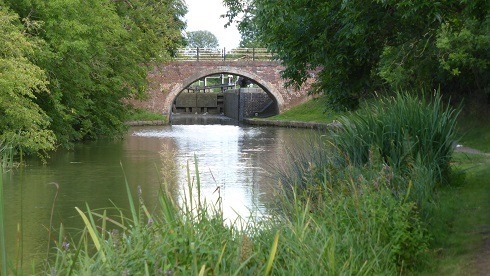 Not a great deal of boats come this way as it is a dead end; about 12 miles and 15 locks to a basin … and then back again! 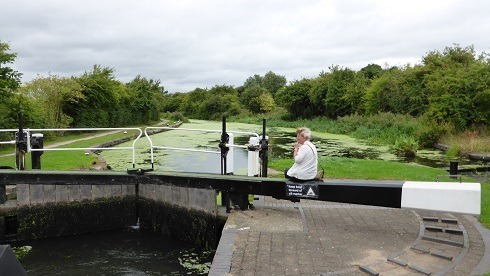 It’s all D.H. Lawrence country . .
Quite an ordeal, to be honest, with shallow canals full of weed … but we made it to Potter’s Lock – just before Ilkeston (or Ilson as they say). 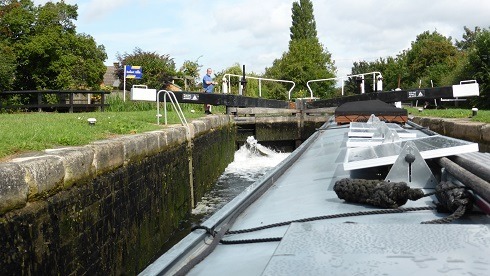 two-thirds the way with just 5 locks and 4 miles to go. 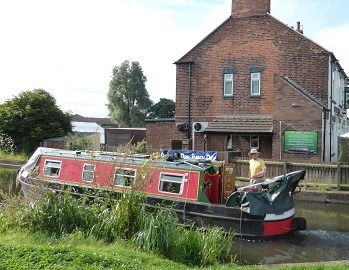 We met a lovely couple on Pinxton Roses – both pensioners and a treat to share locks with. They made the journey all the more easy. 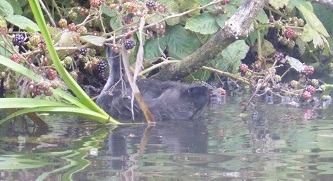 This is a piccie for Jenny – a baby Coot eating blackberries! 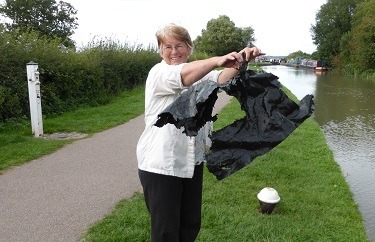 I do hope you get some roofing felt. Cheers!